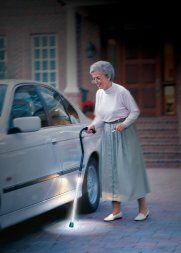 Lighted Walking Cane (AOPL-1000-1) [Lighted Walking Cane AOPL-1000-1] - $24.95 : NewDaVincis.com!, Great Innovative Products, Gadgets and more. The #1 selling lighted safety cane has been totally re-designed with an ergonomic handle, upgraded components and a long lasting high-quality finish. 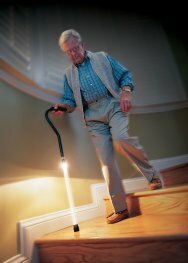 Unlike lower quality LED lighted canes that do not provide proper lighting, the PathLighter is designed to provide ?True? light and help prevent nighttime falls, a leading cause of injury among senior cane users.Â PathLighter is the most trusted Lighted Cane on the market and makes a great gift for cane users at any age. Adjustable height 34" - 39"